This little chap was in the trap this morning, it has the wrong shaped wings for Small Wainscot and I'm stumped. Probably having a dense moment and turning two pages at once! The markings remind me of Webb`s wainscot but your specimen is a bit on the small side; season is ok though? The only one it looks like is Blair's Wainscot, it is correct size and shape , but cannot possibly be that one! I too actually briefly considered Blair`s, but thought it unlikely given its great rarity etc (RDB status). Also the photos I saw (eg in CM`s book) did n`t seem to quite match up. However, looking at the illustration in the Concise Guide, it does seem to match somewhat - also -which I did n`t realise - Blair`s is an Oct moth too. Furthermore, the pointy wing tips are suggestive. I`ll alert others...it will be a very `hot` find if so! I will keep it safe in the fridge. I think it's just a Small Wainscot I'm afraid. I've seen examples with similar markings. Nevertheless, always worth asking the question, Jane - unfortunately lesser mortals, like myself, frequently get things wrong and rely on other's expertise to point us in the correct direction; but that's how we learn, isn't it? Thanks George - it was the strong markings that `threw` me. I could easily be wrong myself - it happens all the time! - but I don't think it looks right for Blair's Wainscot unfortunately! How important are markings compared to wing shape? The wing tip is not like a Small Wainscot, it is really quite hooked with a curved wing. Small Wainscot has a straight wing and rounded tip. Could it be Large Waiscot which is variable in size. The concise guide shows a small version with similar ish markings. 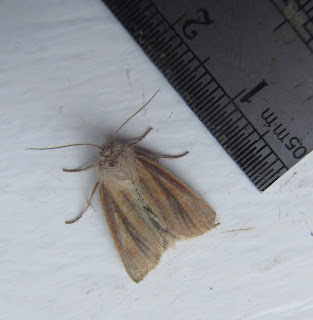 There have been several recent migrant records of Blair’s Wainscot from SE England, and photos of some of them on Twitter look a lot like Jane’s moth. Searching for pics on Google using the scientific name gives lots of equally similar photos. Luckily Jane kept the moth, and George has offered to check it. This would be an even more astonishing County first than the catalaunalis! I will be sending it off to George tomorrow. For what it's worth I would say a small Large Wainscot is most likely, though the flight period is ok. I used to reckon the best time for Blair's was 7pm on 7th October! It flies briefly at dusk and then sometimes soon after dark, but only for a couple of weeks, in stands of Carex acutiforma in east Dorset. It looks plain with fairly dark hindwing as I remember; hindwing much paler on Large. I have now dissected the moth and it is, I'm afraid, just a Small Wainscot (male gen. are distinctive).